The S90 and V90 are the latest models to be built on Volvo’s all-new Scalable Product Architecture (SPA) platform and benefit from Volvo’s ground-breaking Drive-E powertrains. Like the XC90 before them, they feature the new face of Volvo, including the T-shaped LED headlights that make them instantly recognisable. Both models will initially be available with a choice of two 2.0-litre, four-cylinder diesel engines – the tax-efficient D4 and the powerful and refined D5 PowerPulse – and in two trim levels, Momentum and Inscription. 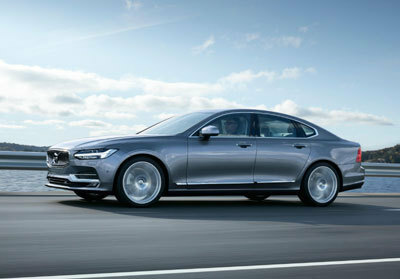 The front-wheel-drive 190 hp D4 comes with an eight-speed automatic gearbox, and offers combined fuel consumption of 64.2 mpg and CO2 emissions of just 116 g/km in the S90. In the V90, these figures are 62.8 mpg and 119 g/km. The 235 hp D5 utilises an innovative technology called PowerPulse to boost responsiveness. This uses compressed air, which is stored in a tank in the engine bay and refilled automatically, to spool up the turbo at low revs. This helps to overcome turbo lag, which is the short delay in the power delivery you experience in traditional turbocharged engines. To harness the engine’s power, the D5 PowerPulse comes with all-wheel drive. An eight-speed automatic gearbox is also standard. Every version of the S90 and V90 is luxuriously equipped. As standard, even entry-level Momentum cars come with leather upholstery, LED headlights with active high beam, two-zone climate control with ‘CleanZone’ air-filtration system, keyless engine starting and heated front seats. Volvo’s Sensus infotainment system is also standard. This brings a 9” touch screen, satellite navigation (including lifetime annual map updates), a sophisticated voice-control system, and access to the internet and a range of cloud-based apps such as TuneIn, Stitcher and Yelp. The S90 gets a powered bootlid, too, while the V90 benefits from a powered tailgate. Pilot Assist, Volvo’s innovative semi-autonomous drive feature, is standard on every S90 and V90. It automatically keeps you at a set speed or distance from the vehicle in front, braking and accelerating with the flow of traffic, and gives gentle steering inputs to keep the car within lane markings at motorway speeds up to 80 mph. Unlike previous versions of the system, it no longer needs to follow another car. Pilot Assist is another step towards fully autonomous driving. The latest version of City Safety is also fitted to every S90 and V90. This includes automatic emergency braking with pedestrian and cyclist detection, and the world-first application of large-animal detection. This feature helps to avoid or limit the severity of collisions with large animals such as deer or horses both at night and during the day. Moving up to Inscription adds Nappa soft leather upholstery, powered front seats, a 12.3” active TFT driver’s information display (Momentum cars get an 8” version), 18” diamond-cut/silver alloy wheels, keyless entry and handsfree boot/tailgate opening and closing. Additional premium touches include walnut interior inlays, rear footwell and side step illumination, and chrome exterior details. The optional Xenium package is available across the range and adds a powered tilt and slide glass sunroof (panoramic in the V90), a parking camera system with 360o surround view, and Park Assist Pilot, which includes automatic parallel and 90o parking. Apple CarPlay is another option and allows you to access certain functions of your Apple device and CarPlay-optimised apps directly via the car’s touch screen, voice control system or the buttons on the steering wheel. Also available is the exceptional Bowers and Wilkins premium sound system, which offers no less than 18 speakers and an output of 1,400W. Both models are available to order now, with the first S90 customer deliveries expected in September and the first V90s in October. For more information on the Volvo S90 and V90, including the online configurators, go to volvocars.com/uk.